Many of the skills journalists use — from reading and writing to researching and asking thoughtful questions — are the same abilities students need to succeed in school and their future careers. 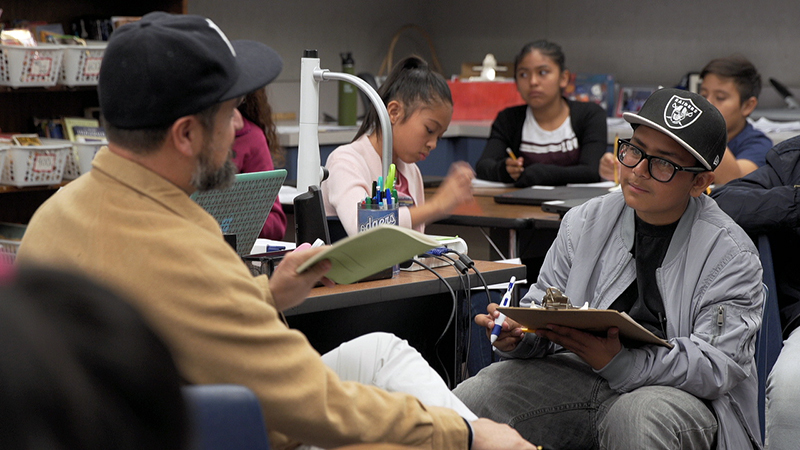 That’s the philosophy behind the Journalistic Learning Initiative, a School of Journalism and Communication and College of Education collaboration whose pilot programs have already improved learning outcomes for underserved middle and high school students throughout Oregon and California. Now the program will continue to expand across the West Coast, thanks to a gift of $500,000 from Nancy and Dave Petrone. Dave Petrone is a UO alum who received a bachelor’s degree in 1966 and an MBA in 1968. Wojcicki leads the award-winning scholastic journalism program at Palo Alto High School in California, and Guber founded the international health and wellness program Yoga Ed. The Journalistic Learning Initiative hires and trains recent journalism school graduates, including many UO alumni, to help classroom educators teach storytelling skills. “Our JLI educators often view the experience as a ‘gap year’ opportunity that allows them work part time alongside a classroom teacher while using off-hours to freelance and build their portfolios,” Madison said. Middle and high school students enrolled in the program learn to research topics they are interested in, from careers in robotics to reducing animal cruelty. They interview experts via Skype or in person. Then they use multiple types of media to produce and publish stories about what they learn. The initiative launched pilot programs in an Oregon middle school and a California high school in fall 2016. It has since expanded into seven schools in Oregon as well as one in Los Angeles. The plan is to launch it on a national scale. The Petrones’ gift will help the initiative continue to expand in California, including adding a second school in Los Angeles in early 2018. It will also support data collection, peer-reviewed research and publishing. Longtime UO volunteers and supporters, the Petrones most recently gave $1 million to launch the UO’s planned Black Cultural Center. 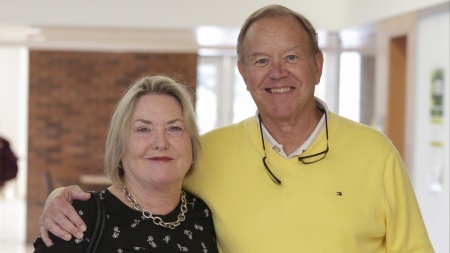 Visitors to campus will also recognize their name on the Nancy and Dave Petrone Fishbowl in the Erb Memorial Union, made possible by a $1 million gift in 2016. And in 2014, they gave $1 million to support the Women in Flight initiative as well as $500,000 to launch the Sports Product Management program. The Journalistic Learning Initiative has already had an effect in its pilot schools. Survey results from students at Oaklea Middle School in Junction City showed that 98 percent of participants found the program useful and relevant. After graduating from the program, 78 percent of students said they challenged themselves more in writing, found it more satisfying to write and were more willing to take on difficult assignments. Educators attribute some of the initiative’s success to its focus on hands-on learning. To Madison, the investment in time and money in the Journalistic Learning Initiative are well worth it. When it comes to Duck generosity, Nancy and Dave Petrone set the bar high. The couple has given generously to academic and athletic programs across the UO over the past 43 years. Their most recent $500,000 gift supports the School of Journalism and Communication’s Journalistic Learning Initiative, a pilot program aimed at improving learning outcomes among middle and high school students. But what inspires their philanthropy? In a nutshell: It’s all about the people. Why did you give to the Journalistic Learning Initiative? Young people are our most important investment. The JLI is an innovative way to build critical thinking skills. It teaches middle and high school students how to ask questions and conduct research. It gives them experience with public speaking and writing. And it builds their self-esteem and confidence. These skills will serve the next generation, no matter their chosen profession. Why do you support the UO and the School of Journalism and Communication? We’ve established many strong relationships throughout the university over the years. I met Duncan McDonald when he was the SOJC’s dean and I was volunteer chairman of the UO’s Oregon Campaign in the 1990s. He inspired confidence. I’ve been very fond of all the SOJC deans to follow, as well as many alumni. I trust these accomplished people to use our investment in a way that will create a strong impact on students and the world. Do you have any advice for UO students? Do everything you can to develop your critical thinking skills. Journalists, in particular, have to remain independent thinkers to meet the high ethical standards their profession demands. But critical thinking is important in every industry. That’s why educational initiatives like the JLI are so crucial — to students’ success and to our society.